aka: "Baby, I'm so imju you..."
Right, so that plan (see last post) didn't work out. Along with some birthday festivities (fun!) and some car problems (horrible! I think it's over for the poor Glitter-mobile...) and some concert action (Michael Bublé = delicious! ), there simply wasn't time for posting. 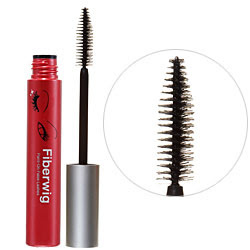 But through all of that, my lashes stayed pretty, thanks to Imju's Fiberwig Mascara. Promising a theatrical falsies-like effect, Imju Fiberwig deposits little fibers onto the tips of your lashes, adding length and colour in one step. I really wish they hadn't mentioned the "falsies" factor though -- while this mascara provides good length, separation, and a nice glossy black colour, it doesn't do much for volume. So those looking for full, fluttery, fat lashes will be disappointed. I do love this mascara for an everyday look though. It's what I had wanted Clinique's Long and Pretty Lashes to be. (Instead, that one gave me long, pretty, smeary lashes.) Imju's Fiberwig does not smear. Ever. I have partied and slept and cried in this stuff and it just doesn't smear. If you get it wet and start rubbing at it, it will flake off a bit, but that's it. Perfect for conferences or important meetings where you want something on your lashes, but simply cannot have smudging. So yes, Fiberwig, I'm totally into you. And at under $13 (plus ship) on Sasa.com, I think I can see you in my future. I'm sorry again for the non-posting, but don't you worry my pretties, even if the writing has been sparse, the beauty exploration has not stopped. Come back soon, I'll do my absolute darndest to get a post up for the end of the week. Stay warm and stay beautiful!